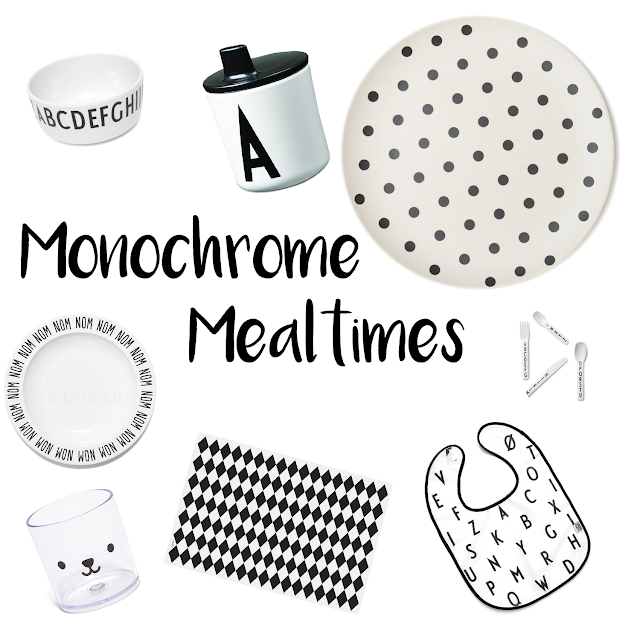 For me, like most blogger moms that I know, I am a monochrome maniac. I can't get enough, in my bedding, in my boys clothes, in my home ware and even during mealtimes. I'll be the first to admit, Noah has 90% garish, and if I'm honest, downright ugly 'crockery', is that the right word? You catch my drift anyway. I'd always bought the cheap and cheerful plastic bits, because well he was 1 or 2 and never really took notice, nor did I. However now with me being on Maternity leave, we eat together at the table as a family much more, and I've often contemplated putting Noahs food on normal a normal plain side plate, just so he feels a bit more grown up now. Can you tell I'm trying to play on the 'you're a big brother now so act like it' ha! We're fortunate, Noah always eats and he eats well, I don't really have any tips or tricks but I definitely think the fact he attended nursery since 8mo helped, as he's seen other children eating their dinners up too. Anyway that's a whole other post. With that being said, I want to treat him to some more grown up plates and bowls. He's very close to being able to just have a booster at the table, and I'd really like him to feel more like Mummy and Daddy with some new bits. Especially as P is due to start weaning in the next couple of months, I want him to feel different to P.
SO, I went to my favourite site, This Modern Life and had a good nosey through all their bits. And as usual, I was in love. They had such a variety of adorable monochrome bits, some were real pot like adult plates would be, others plastic - which I was glad as I would worry in case he dropped the former. They had fabulous mats, which Noah would love for his 'Picmix dinner' as he calls it when he gets a sandwitch and some nibbles as he insists to eat it whilst sitting on the floor. I'm definitely making some snazzy updates to his mealtime essentials which will include many of the above, as I'm certain he'll love them as much as I will. What does your child use for mealtimes?